Patrick Condron, M.Sc., MAC, CAS, ADC. Is Percocet Rehab Aftercare Necessary? What is Percocet Rehab Aftercare? Aftercare is understood as the process of care extending beyond formal treatment. Its primary goal is to maintain and enhance the gains achieved in treatment. Aftercare is necessary for most people recovering from addiction because addiction is a chronic, highly relapsable but treatable disease. Treatment interventions, including aftercare, are likely to have positive outcomes when they are of longer duration, with significant results lasting at least 12 months. According to some research, having patients sign a contract to attend weekly aftercare group sessions, Narcotics Anonymous meetings, and monthly individual therapy sessions, can be significantly effective when combined with encouraging letters from the therapist and 90-day completion certificates/medallions. Relapse prevention involves altering behavior so that high-risk situations are avoided. In relapse prevention groups, an addict can address his/her fears of relapsing back to Percocet use, paying attention to the feedback he/she receives from peers. Chronic use of Percocet results in long-term changes in the brain (neuroadaptation), in which the value of getting the drug predominates over other natural rewards, such as eating, drinking, or sexual activity. Self-efficacy - or belief in one's own ability to succeed. 90% of individuals who try to change their behavior do struggle a lot and don't succeed in remaining abstinent on their first or second attempt. The American Society of Addiction Medicine defines addiction as a chronic disease. Unlike some illnesses which disappear with treatment and/or the passage of time, chronic illness persists for a long time and does not simply disappear. Addiction shares this definition with asthma and hypertension - all are conditions not cured by medication, yet treatable with ongoing behavioral treatments, lifestyle changes and medication. When compared with other chronic relapsable diseases, relapse rates for addiction (40-60%) are below those for hypertension and asthma (50-70%). The challenge of preventing relapse is one of trying to find the right strategies that can support your efforts and implement learned relapse prevention skills whenever you are faced with cues or cravings. That will take time, so don't be discouraged if you can't stay abstinent on your first or second try. If you or someone you love is struggling with their use of Percocet, call one of our support specialists at 1-888-993-3112Who Answers? today - let recovery start now. Continuing care options include counseling, outpatient support groups, and self-support groups such as NA. "Wrap Around" services are also an option, given that most opioid addicts have significant problems in other areas of life. Examples of these services are primary medical care, housing, vocational training, and parenting. 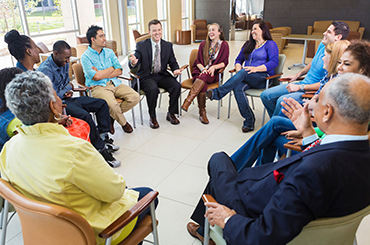 Group therapy and addiction treatment are natural allies, and studies have shown that addicts are more likely to remain abstinent as part of a group apparently because of rewarding and therapeutic forces such as affiliation, support, confrontation, gratification, and identification. Individual therapy provides privacy for a person not able or willing to share their feelings in front of large groups. It also gives the therapist more flexibility in dealing with the client's problems as they arise. More time and attention can be given to exploring recovery issues that are specific to the client. Cognitive Behavioral Therapy (CBT) helps with overcoming self-defeating and negative behavior and thoughts. There is some indication that CBT may be more effective in individual counseling compared to group settings. 12-Step programs, such as Narcotics Anonymous (NA), utilize self-disclosure, sharing, and feedback from the larger group as a means of remaining abstinent from the narcotic. An additional spiritual component emphasizes belief that a "higher power" can restore us to recovery through surrender of our will and our lives to God/higher power. While not well-defined presently, spirituality or religion has improved treatment outcomes when included in a holistic plan of abstinence and recovery. While it is very difficult to assess the efficacy of NA with scientific rigor, there is ample evidence to support that it works by engaging its members in recovery. Reviews of the research-based literature on these programs demonstrate a median abstinence rate greater than 5 years, with average meeting attendance (3 per week). Higher psychosocial functioning and improved self-efficacy has also been observed. A number of maintenance therapies and anti-craving medications are available for the medical treatment of Percocet and opioid addiction. Their main purpose is to prevent cravings or withdrawal. Medication-Assisted Therapy (MAT) with parital or full opioid agonists include buprenorphine-naloxone (Suboxone(R)), buprenorphine (Subutex(R)) for pregnant women and those who cannot tolerate naloxone, and methadone, all of which help in staving off cravings through their partial or full opioid, non-euphoric effects. With no opioid effects, naltrexone completely blocks opioid receptors, and helps with craving in those individuals highly motivated to stay in recovery, such as health care professionals, executives, and those with other incentives to remain abstinent. HIV-AIDS or chronic hepatitis conditions. Liver damage from overexposure to the acetaminophen in Percocet. Chronic pain, and who require ongoing alternative treatments to opioids. Nasal/sinus conditions; use of Percocet has been reported to cause such as nasopharyngeal necrosis when insufflated (snorted). If you are concerned about addiction to Percocet or its health-related problems, help is available and you can recover. Call our 24-hour hotline at 1-888-993-3112Who Answers? where our recovery support specialists can help direct you to the treatment you need. Sober Living Communities, sometimes referred to as halfway houses, typically receive patients who are homeless, or who need the support of an environment conducive to recovery. Therapeutic Communities are designed to serve the addict with the highest severity of addiction, social deviancy, and psychological problems who needs rehabilitation or needs to learn a positive lifestyle for the first time. to alleviate physical and emotional pain, with powerful craving effects interfering with motivation long after detox and formal treatment. Research has demonstrated that the life skills training, 12-Step groups, and enhancement of supportive relationships in sober living communities facilitate better coping strategies and decreased drug use. This behavioral treatment consists of rewarding recovering addicts with vouchers or prizes for progress made in recovery, contingent upon objectively confirmed abstinence - specifically through drug-free urinalysis. A meta-analysis of various psychosocial interventions has shown that CM has the greatest magnitude of treatment effect. A number of opioid treatment studies, have found evidence of the effectiveness of CM with opioid medication-assisted patients (buprenorphine, methadone), opioid antagonist (naltrexone) assisted patients, and those receiving no pharmacotherapy. For those who do not want to take MAT medication, or who are underinsured/uninsured, CM alone is a promising therapy. Family members are critical to the strength and duration of the client's recovery. The family and friends affected by the addicted individual also need recovery. There is a common perception that, once recovery begins, relationships return to normal functioning. They don't! Family members need to re-establish healthy boundaries and develop appropriate roles in the family following years of dysfunction. Family therapy has the double-effect of teaching an addicted parent better parenting skills, as well as breaking the intergenerational "chain" of addiction, given how vulnerable children of addicts are to developing addiction. Mothers struggling with addiction who learn parenting skills in aftercare report less conflict in their families. Many programs offer aftercare family support groups, where the recovering addict can continue to work on relational issues that the addiction once prevented attending to. For example, when the 'fog' lifts from the head of the young addict, he needs support in learning social and vocational skills which will support his new life of recovery. Recovery takes time - perhaps it's time to start the journey towards recovery and wellness by calling 1-888-993-3112Who Answers?. You're not alone! Center for Substance Abuse Treatment. Substance Abuse Treatment: Group Therapy. Rockville, MD: Substance Abuse and Mental Health Services Administration (SAMHSA); 2005. Treatment Improvement Protocol (TIP) No. 41. DeLeon, G. (2008). Therapeutic Communities. In Galanter, M., and Kleber, H.D., eds. The American Psychiatric Publishing Textbook of Substance Abuse Treatment. Fourth Edition. Washington, DC: American Psychiatric Publishing, Inc.
DiClemente, C.C., et al. (2011). Relapse Prevention and Recycling. In Johnson, B.A., editor. Addiction Medicine: Science and Practice. Vol. 1. New York: Springer. Donovan, D.M. et al. (2013). 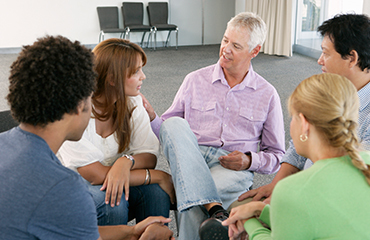 12-Step Intervention and Mutual Support Programs for Substance Use Disorders: An Overview. Soc Work Public Health 28:313-332. Dutra, L. et al. (2008). A Meta-analytic Review of Psychosocial Interventions for Substance Use Disorders. Am J Psychiatry 165:179-187. Finney, J.W., Moos, R.H., and Wilbourne, P.L. (2009). Effects of Treatment Setting, Duration and Amount on Patient Outcomes. In Ries et al., editors. Principles of Addiction Medicine. Fourth Edition. Philadelphia: Lippincott, Williams, & Wilkins. Goeldner, C., et al. (2011). Impaired Emotional-Like Behavior and Serotenergic Function During Protracted Abstinence from Chronic Morphine. Biol Psychiatry 69(3):236-244. Hser, Y-I, and Anglin, M.D., 2005. Chapter 20: Drug Treatment and Aftercare Programs. In Coombs, R.H. ed. Addiction Counseling Review: Preparing for Comprehensive, Certification, and Licensing Examinations. Mahwah, NJ: Lawrence Erlbaum Associates. Kinney, J. (2009). Treatment Techniques and Approaches. Loosening the Grip: A Handbook of Alcohol Information. Ninth Edition. Boston: McGraw Hill Higher Education. Landry, M. (1994). Understanding Drugs of Abuse: The Processes of Addiction, Treatment, and Recovery. Washington, DC: American Psychiatric Press, Inc.
McClellan, A.T., et al. (2000). Drug Dependence, A Chronic Medical Illness: Implications for Treatment, Insurance, and Outcomes Evaluation. JAMA 284(13):1689-1695. McClellan, A.T., and McKay, J.R. (2009). Integrating Evidence-Based Components into a Functional Continuum of Addiction Care. In Rie, R.K. et al., editors. Principles of Addiction Medicine. Fourth Edition. Philadelphia: Lippincott, Williams & Wilkins. McKay, J.R. (2009). Continuing Care Research: What We've Learned and Where We're Going. J.Subst AbuseTreat 36(2):131-145. National Collaborating Center for Mental Health. Drug Misuse: Psychosocial Interventions. NICE Clinical Guidelines, No. 51. British Psychological Society, 2008. Petry, N.M., and Carroll, K.M. (2008). Contingency Management is Efficacious in Opioid Dependent Outpatients Not Maintained on Agonist Pharmacotherapy. Psychol Addict Behav 27(4):1036-1043. Rosenbaum, C.D., et al. (2012). Nasopharyngeal Necrosis after Chronic Opioid (Oxycodone/Acetamenophen) Insufflation. J Med Toxicol 8(2):240-241. Rounsaville, B.J. et al. (2009). Individual Psychotherapy. In Ries et al., editors. Cited previously. Stine, S.M., and Kosten, T.R. (2009). Pharmacologic Interventions for Opioid Dependence. In Ries et al., editors. Cited previously. Walton-Moss, B. et al. (2013). Relationship of Spirituality or Religion to Recovery from Substance Abuse. Journal of Addictions Nursing 24(4): 217-226. Wise, R.A., and Koob, G.F. (2014). The Development and Maintenance of Drug Addiction. Neuropsychopharmacology 39:254-262.